Update: WOW! Three hours later and all the sponsorship spots are GONE! What an amazing morning. If you missed the chance, go ahead and write a check and send it to The Downtown Rescue Mission for their everyday operating expenses. They will make good use of your funds! Once a month my church worships at Huntsville’s Downtown Rescue Mission, a place whose mantra “a heart for the homeless” is put into action everyday in the lives of the people who live there. My husband feels particularly called to helping lead this monthly worship ministry and we have tried to take part as often as possible. Our children have grown up attending and participating in “Special Church” as we call it. I love to visit with the women and children who live at the Mission and attend the Monday evening service. It’s no secret that babies and children are a joy in my life…and these kiddos are no exception! No matter how life differs from one woman to another at that monthly Mission service, there is a common bond that all mothers share. First teeth, first steps, sleeping patterns, fussy babies, picky eaters, headstrong toddlers — these things are universal to those of us who answer to the call of “mama”. Which is why talking to the mothers at the Downtown Rescue Mission is so easy. In motherhood we walk on common, holy ground. The last time I worshiped at DRM I looked into the faces of those mothers and wondered when, if ever, they’d had the opportunity to have portraits of their children made. And when, if ever, they’d been able to be in those portraits. I was pretty sure I knew the answer. So I called one of my pastors and asked if he’d put me in touch with someone at the Mission who might help me make that happen. This Sunday, June 30th, from 4-7 I’ll be photographing all of the mothers and children who live at the Downtown Rescue Mission. I am SO excited. This is like Christmas morning for me! If you’ve ever seen me in action on mini session day, you know that I thrive on these non-stop, back-to-back, one-crazy-toddler-after-another kinds of days. And being able to do it for the families at the Mission is the icing on the cake! Would you join me in offering this portrait gift to our fellow mamas? I would like to provide each mama at the Mission with a portrait package that includes a disc of images, a full set of printed proofs, two framed 8×10’s and a set of wallets. I’ve figured out a way to make all of that happen for $25/family. Which is where you come in. I know the hearts of my friends and clients and I know that you will rise to this challenge. 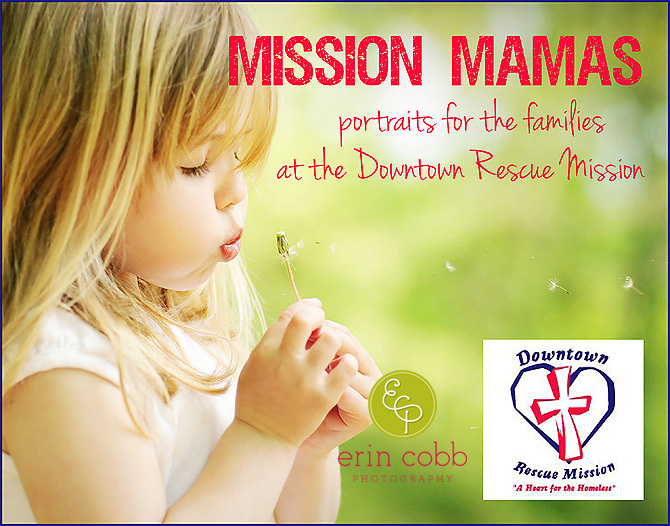 If you’d like to sponsor a portrait package for a mama at the mission please email me (erin at erincobb dot com), send me a message via Facebook or call me (256-656-1500). There are 10-15 family groups living there and I know that together we can give each of them this priceless gift.